'In the Asean market, the train left at the same time for India and China, but while India's ride has been symbolic of India's rickety railways, it seems that China's has been on a bullet train,' note Renjini V R, Manmeet Ajmani and Devesh Roy. Multilateral trading arrangements under the World Trade Organisation have expanded over time. Yet, the current global trade landscape is characterised by an overwhelming number of regional trading arrangements. The proliferation of regional trading arrangements has been so pervasive that Jagdish Bhagwati calls it a spaghetti bowl. All countries try to tap into emerging markets through trade agreements. One of the strongest emerging markets is the group of nations that comprise the Asean. Asean was established in 1967. Since then it has crossed a significant milestone by forming the Asean Economic Community in 2015 by integrating 10 countries with different economic, cultural and social backgrounds. Asean is uniquely placed, being near two emerging giants of the world -- China and India. Asean itself has been a big growth pole in Asia. Hence, there has been a special interest in trade negotiations between Asean, China and India. 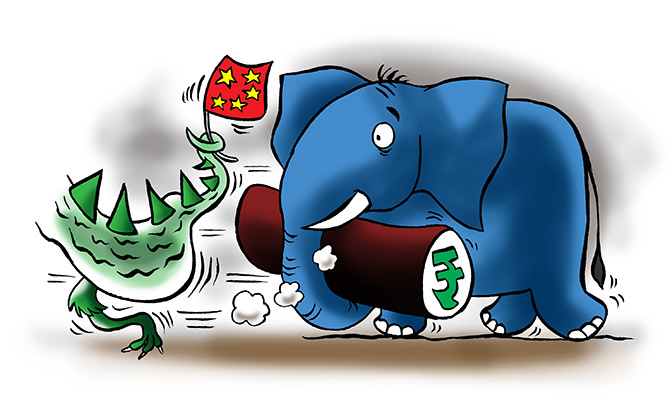 China’s and India's trade with Asean has been increasing over the years as compared to non-Asean countries, which explains the keen interest of both economies. Yet, there is a big contrast between China and India. While China is an established player in the world market with export and import shares of more than 10 per cent, India's share is less than one-fifth of China's. Since both India and China have pursued greater integration with Asean (both have signed free trade agreements), the contrasting outcomes highlight the factors underlying the differential or even distinct performance of the two in global trade. China's share in Asean trade is around 15.2 per cent, with an export share of 11.4 per cent and an import share of 19.4 per cent, making it Asean's top trading partner. India's share in contrast is a mere 2.6 per cent, with export and import shares of 3.3 per cent and 1.8 per cent respectively. The differences between China and India in trade with Asean are visible at every stage, starting from the trade negotiations themselves. Soon after China's entry into the WTO in 2001, China started trade negotiations with Asean by signing an initial framework agreement in 2002. Within a decade China completed the agreement governing the trade in goods, services and investment, finally establishing the Asean-China Free Trade Area in 2010 itself. Hence, the FTA frontier was reached within eight years. India, despite her cordial relations with Asean and her 'Look East' policy, could not catch up. India also initiated FTA negotiations with Asean in 2003, right after China. But it took six years to sign an agreement on trade in goods (in 2009), while the investment and service agreement was signed only in 2014. Finally, it is expected that the India-Asean FTA will be effective only by 2019. The whole journey would have taken 16 years, twice the time China took to reach there. China clearly is both a first mover as well a fast mover. Indeed, the impacts show in the relative trade performances of China and India. Trade between China and Asean has increased manifold, while India seems to have a 'Hindu rate of growth' of trade. China moreover was able to quickly diversify its exports from agriculture to manufacturing, such as machinery and textiles, whereas India's exports are still dominated by primary products. China's share in Asean's trade increased from three per cent in 1995 to 16 per cent in 2015, replacing the United States, the European Union and Japan. In contrast, India's share in Asean's trade increased by only one percentage point to two per cent. At this point, India's potential for trade with Asean becomes pertinent. Our empirical trade analysis shows that both China and India have been trading above potential, where potential is a function of trade-determining fundamentals. However, the extent of over-exporting to Asean is significantly higher for China. Moreover, India's engagement with Asean is marked by under-trading with countries like Vietnam and Cambodia, the two fast-growing countries in Asean. Looking at competition between India and China in the Asean market, China is in close competition with India in most of India's top exports to Asean, but the converse is not true. Relegated to exporting primary products, China has engendered competition with India, given that it is easier due to the low technology and capital intensity of her exports. China has also moved up the value chain, which is reflected in low competition with India in value terms. India's hesitation in bringing off deals in quick time has thus resulted in lower trade with the Asean region. Time is of the essence here. India has been tardy with the issue of sensitive commodities, with bureaucratic delays a function of relying on primary products, where the political economy is comparatively tenuous. The new world of trade is about globalised value chains. Unless India gets on this train the comparative story of India and China in different markets will be repeated. The government's chief economic advisor recently mentioned that India is catching a train that left 20 years ago. In the Asean market, the train left at the same time for India and China, but while India's ride has been symbolic of India's rickety railways, it seems that China's has been on a bullet train. Renjini V R is with the Indian Agricultural Research Institute, while Manmeet Ajmani and Devesh Roy are with the International Food Policy Research Institute. Has the economy dramatically changed recently?